For any parent who is about to embark on any overseas trip with their baby, there is a lot to carefully plan. Jet lag, the disruption to your circadian rhythm following high-speed travel through different time zones, can affect how quickly and pleasantly you start your travel adventure. Our natural night and day rhythm or body clock, becomes out of synchronisation with alterations to the daylight and darkness cycles that we are used to. We release different hormones to enable our bodies to function, at different times of day. So, digesting food and settling to sleep may be affected while we adapt our hormones to the different clock and allow our bodies to adjust to a new rhythm. As well, our body temperature has a daily cycle and so will be out of sync when moving into a different time zone. For your baby travelling into another time zone these three areas of hormonal activity: body temperature regulation; hunger and digestion of food and sleep will be affected during the period whilst they adjust to a different time zone. Whilst you as an adult can conceptualise the effect that the alteration of time zones is having on your body your baby will not. As they rely on their sensations and feelings as signals to cue you about their needs their period of adjustment to a new time zone may be lengthier. The following planning tips are aimed to make this transition to a new time zone as easy as possible. If you are travelling for a specific event such as wedding or family gathering, allow extra days to arrive and settle into your new environment and time zone so that you can enjoy the event. Some families will choose to break their travel up to allow a more gradual adjustment to times. Such as stopping in Singapore or Dubai for a few days then moving onto their final destination. Research your destination ahead of time for weather forecasts. Have appropriate clothing on hand to manage those first few days of your arrival. It may be summer where you are headed, however, they are having a cold snap and cool weather clothing is needed as you arrive. Include a few outfit changes for your baby, and enough nappies to last a day or two is helpful in case your luggage is delayed or worse, goes missing. Check with your airline what they will accept on flights for the needs of your baby. Most full service airlines provide disposable nappies, wipes, boiled water and baby food if they are notified ahead of time that you have a baby on board. We recommend that you consider travelling with the CoziGo sleep cover. The CoziGo cover is fabulous at blocking 97% of light when your baby is trying to sleep in a plane bassinet, while also allowing ventilation. This multifunctional and essential travel item is then very useful with it’s standard fitting to most strollers to act as a cover to keep things dark for your baby to sleep while you are on the go. We also recommend that you consider a set of noise cancelling headphones for your baby to use during sleeps. One school of thought is to set your watch to destination time when you first board the flight and then operate as much as you possibly can on a destination time frame during the flight. This way you are using the flight time to help body clock adjustments to occur. 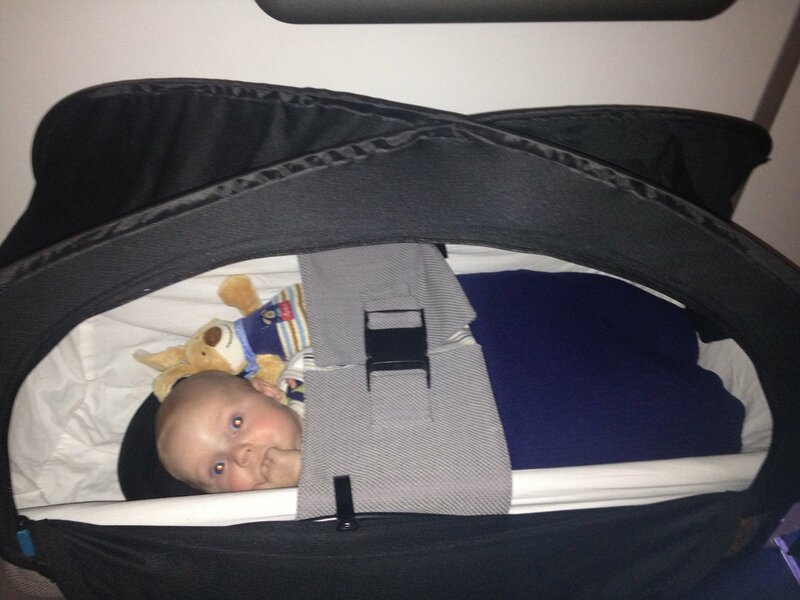 Encourage your baby to sleep on the flight. Don’t be too concerned if you need to assist your baby to sleep more than you usually would at home. It is a very different environment than home, and it is expected that they may need more help and support both going to and during sleep. They may also have more regular sleeps with shorter wake periods then they usually have because their sleeps may be more interrupted. Long haul flights are very dehydrating to the human body. This is because the air inside the cabin of a plane has a humidity level of 10-20 % compared with indoor humidity of around 30-65 % on the ground. For this reason it is vital to keep both yourself and your child well hydrated in order for you to cope with this travel as well as possible. We do not support sedating your babies on flights. This is for two reasons. Firstly there can be a paradoxical effect, meaning that for some children the sedation has completely the opposite effect. Secondly, that the sedation can dull down a baby’s breathing (respiratory) drive, where they take less breaths per minute than normal and in turn, lower their oxygenation levels. This may pose a serious health risk to your baby during a flight. Finally you have arrived at your intended destination. Aim to get to your accommodation as quickly as possible so that you can refresh and rest. Aim to take advantage of fresh air and safe sunshine to help to begin to cue your bodies to the new time zone if you arrive during daytime. For the first sleep you do in your destination be sure to offer plenty of wind down, or de-stimulation time with your baby in the room where they will sleep before you settle them to sleep. This helps your baby to locate to their new environment feeling safe and supported. The aim of wind down time is to help your baby to calm and relax in preparation for sleep, this is particularly helpful if they have been around a lot of people and noise and a transition from lively awake times to sleep. Wake your baby at 7am local time the next morning despite how wakeful the night has been. This is to help your baby quickly acclimatise to the new time zone that you are in and aim to be ready for bed around 7pm at night. Once awake, offer their usual milk / meals and offer sleep times as they normally would at home. Wake them in the day if need be so that they will sleep better overnight. If we let babies compensate for a wakeful night by letting them sleep for long periods in the day, this will on fuel their wakefulness for the night ahead and not resolve the altered wakefulness very quickly. If you find that your baby is wakeful through the night, keep their sleep space as dark as possible. If you are staying in a hotel this should be no problem as they usually have very heavy drapes that you can pull. You may need to offer a milk feed or snack while their appetite is adjusting to a vastly different time zone to when they usually consume food. If they are wide awake during the night, stay in a darkened area, preferably the room that they sleep if possible, and have quiet cuddles or play with low engagement until they feel sleepy enough to return to sleep. You may find over a 20-40 min period of quiet, cuddly play in very low stimulation they are able to return to sleep easily. Over a period of 3-4 days this should start to improve each night. If you are lucky enough to have helpful family or friend support in your new location, you may be able to seek help with your baby in the day if you have spent a lot of the night awake, don’t be afraid to ask so that you all settle into your new time zone as quickly and stress free as possible. Relatives and friends will jump at the chance to spend time with an out of town baby! During the day, offer as much sun safe daylight sun exposure as possible. Try and get out and walk in the sunshine and get plenty of fresh air. If this is not possible, then set your child’s play area up near a sunny window, or keep a lot of lights on for maximum brightness. Avoid night-lights overnight in the room where your child sleeps, as this mimics dawn and confuses them as to when wake up time really is. As the environment is new, if you feel that some light is required, it is better to have the light source coming from outside the room. You may choose to plug your night-light in just outside the bedroom, or leave a toilet light on down the hallway, as this is less impactful. Older toddlers and young children may be happier if you leave them with a safe battery free torch. Offer your baby milk feeds 3-4 hourly during daylight hours to encourage more daytime feeds and reduce night feeding. Offer their bigger meals at regular intervals in the day and minimal amounts overnight if possible. For breastfeeding mums, breast milk production is different at various times of the day. Dehydration, lack of sleep, breast refusal or poor feeding can alter your usual production, so it is important that you rest, re-hydrate and eat well to regain any loss of supply that may have occurred in your travel. Be patient and sensitive to your baby’s needs, so that you can all enjoy the reason that you have travelled away from home. If you are returning to work on arrival home, allow a good 4-5 days to a week if you can to not only settle yourself into a good pattern again, and expect that you may up at night more than usual. Consider cooking up some healthy and easy freeze meals before you leave, so that you know meals are taken care of when you return and assist you to eat well rather than rely on take away if you are too tired to cook or can’t get to the supermarket to stock up in those first few days. I was lucky that I had fabulous neighbours and when either of us travelled, we always made sure the returning family came home to a box of bread, milk, fresh fruit and a meal. Enough to get through that first day/night home. If you find that you are having difficulty assisting your baby back into manageable sleep patterns upon your return home, please visit us a www.carolinesangels.com.au and we will be able to assist you.